RUSH: Well, Rahm Emanuel, the mayor of Chicago, is livid. He's calling this a whitewash. He's saying that Smollett is using hate crime laws to advance his career. He's saying that victims of hate crimes going forward are never gonna be believed anymore, this is a travesty. It is the exact opposite of what our caller from the south side of Chicago was saying. He is livid, Eddie Johnson is livid, and we're gonna have the audio for all of this, I guarantee you, but I am not going to be distracted by it, folks. I have some things I intend to say about this. I’m not gonna let the whole Mueller story be erased and be taken off of everybody's front page by this story today, which I think may also be a factor going on. RUSH: And now fulfilling a promise. We'll go back to Chicago. And here are the audio sound bites of a very upset Eddie Johnson, police superintendent of Chicago, and the mayor, Rahm Emanuel. And as I said, there are a bunch of law enforcement people from all kinds of spectrums -- defense lawyers, prosecutors, they're all saying they've not seen anything like this. A slam dunk case. I mean, who does Smollett think he is, Hillary Clinton? She's the only one that gets away with stuff like this. She's covered up for, she's not charged, she's exonerated before she's even interviewed. They let people come in and act as her lawyers who were nothing more than her hack PR people. They proclaim her innocent because she didn't intend to break the law by having an illegal private email server where she was trafficking in classified documents. And Obama knew it because he was emailing her on that address to her private server. So 16 counts just have disappeared against Jussie Smollett! They never happened. His record's gonna be expunged. It never took place. Here is Eddie Johnson, the superintendent of police earlier this afternoon in Chicago. JOHNSON: You all know where I stand on this. Do I think justice was served? No. Where do I think justice is? I think this city is still owed an apology. I've been a cop now for about 31 years. When I came on the job, I came on with my honor, my integrity, and my reputation. If someone accused me of doing anything that would circumvent that, I would want my day in court, period, to clear my name. I've heard that they wanted their day in court with TV cameras so America could know the truth, but no, they chose to hide behind secrecy and broker a deal to circumvent the judicial system. 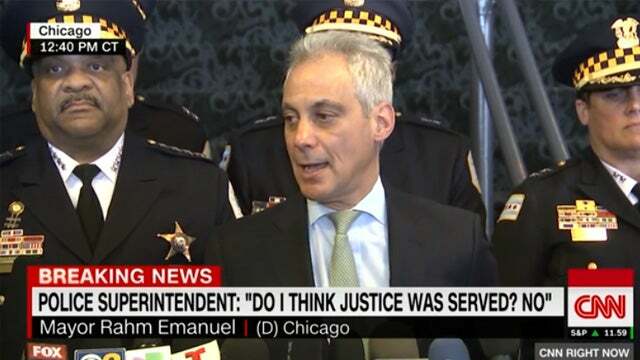 RUSH: Here is the mayor of Chicago, Rahm Emanuel, who is livid. And I’m shocked to say, many of the things I've heard him say I have to agree with. I never thought that day would happen, either. EMANUEL: He did this all in the name of self-promotion, and he used the laws of hate crime legislation that all of us collectively, over years, have put on the books to stand up to be the values that embody what we believe in. This is a whitewash of justice. The grand jury could not have been clearer. You cannot have, because of a person's position, one set of rules apply to them and another set of rules apply to everybody else. In another way, you're seeing this play out in the universities, where people pay extra to get the their kids a special position in universities. Now you have a person, because of their position and background, who's getting treated in a way that nobody else would ever get close to this type of treatment. This without a doubt a whitewash of justice and sends a clear message that if you're in a position of influence and power, you'll get treated one way; other people will be treated another way. RUSH: Well, he ought to know. He worked for the Clintons for a while, and they regularly were able to take advantage of this duel system. Mrs. Clinton is still the kingpin in getting away with it -- and that's what needs to stop.